Very funny at times, serious at others... "The Secret Of My Success" starring Michael J. Fox is one of my all time favorite movies! J. Fox's acting is right on, and the other actors are great too! Fox plays two characters in this film; Brantley Foster and the *made up* Carlton Whitfield. Brantley comes to New York with the hopes of getting a successful business career. He eventually gets a job - as a postal boy! From that point, LOTSA weird things happen as he makes up an identity ('Carlton Whitfield') to get in touch with the other "SUITS" (business men), and to find out more about this beautiful girl that he saw the other day. The character Melrose (John Pankow from TV's "Mad About You") is also very cool. He's Brantley's co-worker at the post office. The character Vera made me crack up a few times too! I think this movie captures the vibe of New York. (Where the storyline is going down) If you get into the main character, it's almost like you're THERE, ya know? See this movie a few times and you'll understand what I mean. The film is backed up by some FANTASTIC music. The Soundtrack is really special! Songwriter/Producer David Foster is the music producer in this picture, and he even made a hard rockin' song with the American multi-platinum selling rock band Night Ranger (who by the way are BACK in the music world with two great new studio albums called "Neverland" and "Seven") for this movie. 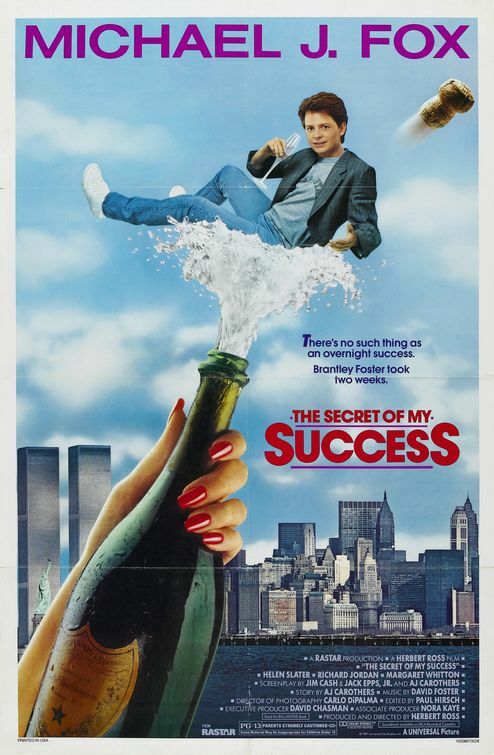 The song is called "The Secret Of My Success" and is the film's theme. I give this film 10 stars because it's such an enjoyable, entertaining one!